5 Comments for "Brazilian Black Beans and Sausage"
Very good, but I did make some changes after reading the comments. I used Turkey kielbasa sausage, used 1 cup water & 1 cup chicken broth. Added 1 teaspoon of Cajun seasoning and a dash of cayenne pepper. My son and husband loved it so much that they ate the entire skillet! I didn't get to eat any of it! I looked up authentic Brazilian Black Bean recipes and noticed most of them had tomatoes in them, so we added a can of diced tomatoes. I also added a bit more cumin, a bay leaf, some smoked paprika, and some hot sauce. It was delicious! I agree that the original recipe needs more seasoning. This is a super tasty one-pan dinner. I like the texture better with brown rice. Great for lunch the next day too! My husband and I really enjoy this recipe! I add cayenne pepper to give it some heat and extra cumin. I have made this twice now, once with white rice and once with brown. 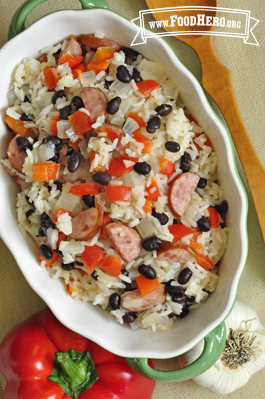 We strongly preferred the brown rice version and were pleased because it's healthier that way!